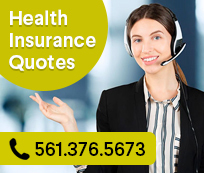 Searching for a complete health insurance policy for yourself or your family in the Boca Raton, Florida area? Delray Beach Health Insurance offers you major medical nsurance plans by Aetna, Humana and Cigna among other A rated companies. Major Medical is traditionally the most popular form of individual and group private insurance. This type of health insurance allows you the freedom to use any doctor or hospital you choose, anywhere in the United States. Generally, premiums (the amount you pay for your insurance) on a Major Medical are higher than they are with other plans such as PPOS and HMOS. Within the payment structure of the Major Medical are the deductibles (the amount of money you must pay before the insurance company pays anything), and CO-INSURANCE (The portion of the bill that is remaining after you meet your deductible and which is paid for by both you and the insurance company - typically eighty percent is paid by the company and the insured pays 20%, usually of the first $5,000 of the bill Freedom to use any doctor or hospital. Delray Beach Health Insurance represents some of the highest rated major medical plans available including Humana, Cigna and Aetna. Although we are based in Boca Raton, we are able to assist anyone throughout Florida. To discuss Major Medical Insurance as an option to meet your needs, or a free consultation or phone or email quote, feel free to contact us at (561) 732-4533 or Email us with any questions you might have. Need a Major Medical Quote?